Or how to hang on a tenterhook for 26 years. Spoiler Alert! If you don’t know that The Joker dies in The Dark Knight Returns, don’t read this line. Every once in a while a comic comes along that has some undefinable quality that makes the whole more than the sum of its parts. When the parts in question include a writer at the top of his game then the end result has the potential to be something very special indeed. A rare comic event. A lightning strike of multi-panel creativity that happens perhaps only once in a decade. In 1986 it happened twice. In September of that year, Alan Moore’s seminal Watchmen began its 12 issue run. Seven months earlier, a four-issue Batman mini-series by Frank Miller had heralded a change to the way comics would be perceived as a literary and artistic form, paving the way for a grittier, more adult approach to the superhero genre. 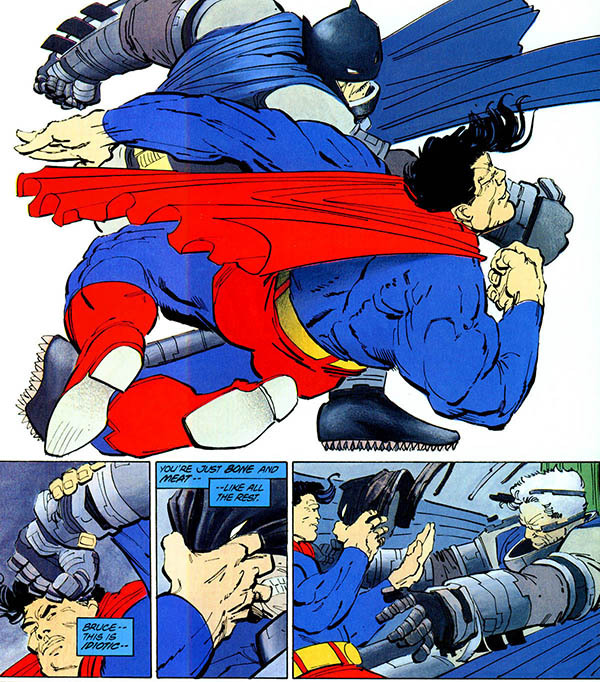 Batman: The Dark Knight Returns, written and pencilled by Miller, inked by Klaus Janson and coloured by Lynn Varley, caused enough of a splash in 1986 that the ripples are still going strong: The Dark Knight Returns is still in print as a trade paperback collection, and the original is still regarded as the blueprint of how to reimagine an established character in a way that reaches a new audience without alienating the existing fans (well, not all of them anyway). The covers of Miller’s books are iconic images, so why did none of them find their way onto the covers of the DVDs? I wasn’t a Batman fan particularly, and my comic purchases back in early 1986 were mostly trawled from the growing selection of indie titles. My only regular purchase from either of the big two stables was DC’s Swamp Thing. The Dark Knight Returns changed that, and twenty-eight years on I would still describe it as the best comic I have ever read (probably – Watchmen was pretty damn special, and Alan Moore’s work on Swamp Thing certainly had its moments, and then there’s The Rocketeer of course…). As a quick aside, and because I’m in pedantic mood, technically Batman: The Dark Knight Returns refers to only the first of the four books in The Dark Knight series. ‘Returns’ was the first, ‘Triumphant’ the second, ‘Hunt the Dark Knight’ the third and ‘Falls’ the fourth. But as ‘Returns’ came first the name stuck for the remainder of the series, a position further ratified by the trade paperback collection of the four books being published under the name The Dark Knight Returns. I could wax lyrical on the virtues of The Dark Knight Returns pretty much indefinitely, but thankfully for us all I’m not going to. I have a nostalgic bias that makes it difficult for me to be entirely objective about the comics I was reading back then, and the pros and cons of the comic aren’t what this article is about (yes, cons too; I may be fan but I’m not suggesting that The Dark Knight Returns wasn’t without its flaws). What this article is about is the fact that in late 2012, 26 years after the comic was published, a direct-to-DVD animated version of The Dark Knight Returns appeared. The four-issue comic was transcribed to two DVD releases, cunningly titled Part 1 and Part 2 respectively. There had been hints they were coming. In 2011, Batman: Year One had appeared as an animated film released by ‘DC Universe Animated Original Movies’ (a collaboration between Warner Bros. Animation and DC). Batman: Year One had been Frank Miller’s 1987 prequel to The Dark Knight Returns – a reimagining of Batman’s origin to transport it into the Dark Knight universe – so it seemed logical that The Dark Knight Returns would soon be in line for the same treatment. The animated Year One received a pretty mixed bag of reviews, from both critics and Batfans, though a significant percentage of the negative comments were directed at a rather bored sounding voice cast, and both camps were in agreement that overall the film was faithful to its comic source. Would the same be true of The Dark Knight Returns? Miller’s 55 year old Bruce Wayne. Thankfully the moustache only lasts a few pages before Bruce decides that crime-fighting in the eighties doesn’t have to mean looking like Magnum P.I. And that’s all the story that matters. If you know the comic then you don’t need me telling you about it. If you don’t know the comic then an article about how the animated version compares to the comic probably isn’t going to be floating your boat. For those with an interest in continuity in the tangled mess that is the DC Multi-verse, everything that transpires in The Dark Knight Returns takes place on Earth-31. I have to confess I’m one of those dissenting voices who would much prefer for the comic houses to say “you know what, this story screws around with current continuity for this character, but it’s such a good story to Hell with continuity, let’s just publish and be damned”. I’m a grown up. I can cope with that without needing the story to be transplanted to an alternative universe to avoid a clash with that other story where Commissioner Gordon has already been disgraced for swimming naked in a large vat of butterscotch blancmange . But I digress, so let’s move on. Swiftly. 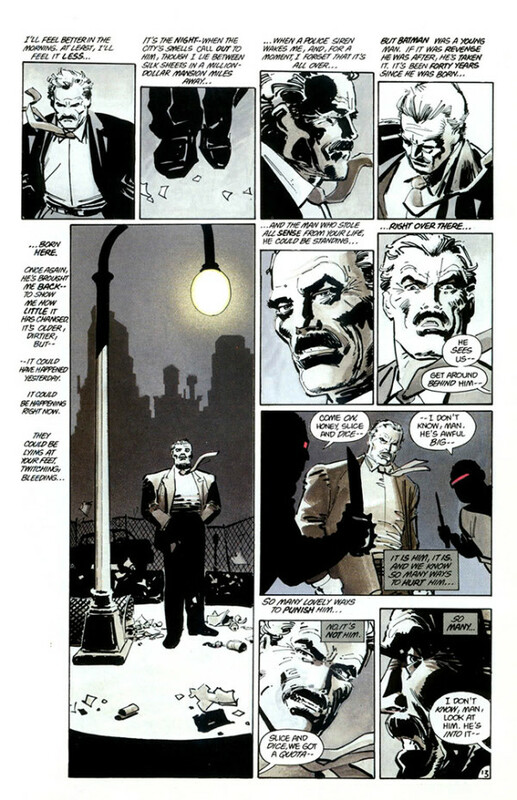 The four issues of the comic each form a complete story with a couple of common threads running through to connect them. If we go with standard Friends naming convention, we have “The one where Harvey Dent has just one face”, “The one where Batman gets seriously beaten up and Robin’s a girl”, “The one where The Joker dies” and lastly “The one where Batman beats Superman”. As you’d expect, the two DVD releases cover two books each. Part 1, released in September 2012, covers the Harvey Dent and Mutant Gang story arcs, coming it at 76 minutes. Part 2 was released in January 2013 and deals with The Joker and Superman segments, also running for 76 minutes. The animated 55 year old Bruce Wayne. Compare this shot with the equivalent panel on the page above (right hand side, third panel down). The first disappointment – and this was a biggie for me – was the cover artwork. Don’t get me wrong, the art they used is pretty good, but the covers of the four comics are iconic, most particularly the silhouette images for books one and four, and I have to assume there was a good reason for not using them for the DVDs. The second disappointment – and to be honest I was less concerned about this one – was the lack of extras on the standard DVD releases. Part 1 has nothing but a preview of Part 2. Part 2 has nothing but a preview of Superman: Unbound. There are special edition releases and the ubiquitous “deluxe edition” that fare slightly better for extras (especially if you plump for the blu-ray releases) including the featurette “Batman and Me: The Bob Kane Story”, so track down those DVD special releases or the blu-rays if you’re a fan of extra bits (just don’t expect anything that special from the special editions – the extras are better than nothing, but not that much better). At the time of writing, both Part 1 and Part 2 are available from Amazon in the UK on DVD and blu-ray, but the deluxe edition of both parts and the DVD special edition releases are only available as US imports. 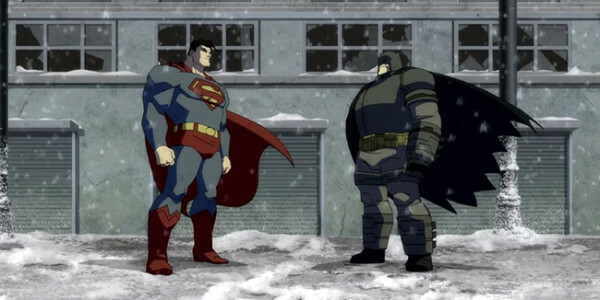 Miller portrays Batman and Superman as almost grotesque parodies during their final battle. For UK audiences especially, only one name is likely to stand out from the cast listed on the DVD cover; Peter Weller has popped back into the collective geek consciousness recently with his turn in Star Trek Into Darkness, but for most of us of an age he will be forever Robocop (even more so since the ‘reboot’ of that franchise). More seasoned geeks may also pick out Michael Emerson of Lost who does a nice line in ‘understated derangement’ as The Joker in Part 2. The rest of the cast is made up of the standard selection of voice-over regulars, jobbing character actors and those looking for gainful employment between occasional appearances in daytime soaps. I would like to give special mention to one other name though: Townsend Coleman. He’s been a voice artist in animated series since Inspector Gadget in 1985. He was the voice of Michelangelo in all 193 episodes of the 80s animated Teenage Mutant Ninja Turtles and the voice of the Tick in The Tick, as well as doing turns on dozens of other series including Pinky And The Brain and Superman and voice work on the console classic Mass Effect, though for me the high point of his career has to be playing Gobo in Fraggle Rock. Voicing a comic adaptation is tough; when your audience doesn’t have to expend any imagination on how a character should look they have more time to work on how they imagine a character should sound. Picking the right voice involves playing the percentages, and no matter how well you choose there’s always going to be a proportion of your audience feeling aggrieved that your Batman doesn’t sound like the one in their head (and in an infinite universe there’s going to be somebody out there who wholeheartedly believes that The Caped Crusader should sound like Joe Pasquale on helium). The producers of The Dark Knight Returns appear to have taken note of the criticisms directed at the voice cast of Batman: Year One and voice work on both of the new DVDs is a big improvement. Emerson’s Joker is the stand-out performance (Weller’s voice has the right world-worn ruggedness of the 55 year old Wayne – the actor is actually more than a decade older than the character he’s voicing – but occasionally it lacks the emotional depth the dialogue seems to require), and everybody else seems to be making at least some effort to keep Miller’s words alive and kicking. That’s not always an easy task, as what works well written on the page can sound stilted or clunky when spoken aloud. It’s a problem that afflicts Miller’s other adaptations to varying degrees; Sin City’s vocal pendulum swings wildly between sublime and ridiculous, 300 is best watched with the sound muted. The Dark Knight Returns on film was never going to look the way it did in the books. Every fan wanted it to look the same, of course, but deep down they also knew that just wasn’t going to happen. Miller’s pencil work ranges from beautifully minimalist to sumptuously detailed, at times even flirting with surrealism in its depiction of Gotham City and its inhabitants (particularly in the final showdown between Batman and Superman where both characters are portrayed almost as grotesques). Both versions of the death of The Joker. Colour aside, the new animation retains much of the flavour of the original comic without straying too far away from the style of previous Batman animations. What Miller does is art, and like all art it isn’t going to be to everybody’s taste. It also isn’t going to translate easily to moving pictures, and certainly not on the budget of a direct-to-DVD production. The end result is a compromise that on the whole works pretty well. 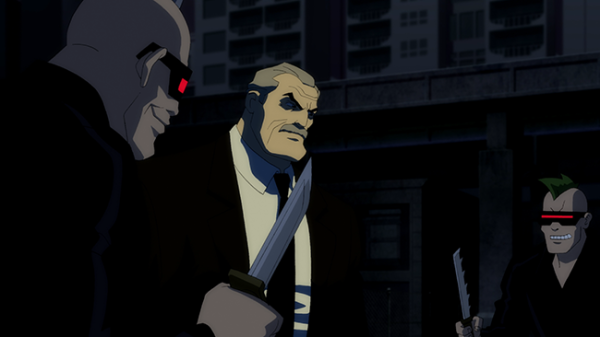 The style of the animation is more in keeping with previous Batman cartoon capers than Miller’s artwork, but the construction of the scenes and the viewers perspective on the action retain the feel of the comic. 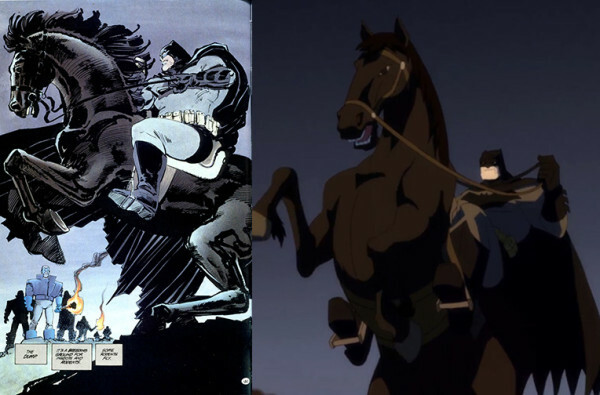 I’ve chosen a few of the obvious moments from the story for panel-to-frame comparisons but there are plenty of other scenes I could have chosen to demonstrate that the animated Dark Knight Returns looks like the original comic Dark Knight Returns, just drawn by somebody who isn’t Frank Miller and who is trying to produce pictures that are physically rather than emotionally moving. Whilst the animation loses out in direct comparison with Miller’s art, it gains in terms of the flow of the narrative, which is to be expected – it’s always going to be easier to tell a story using speech and moving pictures than with text and static drawings. Some sequences were never going to be able to compete with the drama of the original artwork. There are two big provisos here though. The first is Batman/Bruce Wayne’s inner monologue. It was a device Miller used a lot. An awful lot. The film-makers were always going to have to trim it back for the animated version, but they may have gone too far and there are some surprisingly long stretches of silence where some voice-over monologue might have been slipped in unobtrusively. Paradoxically, whilst they have lost too much of the monologue they have also kept too many of the newscaster’s interludes. Regular interruptions to the story to hear how Gotham’s media was interpreting that story was a device that worked surprisingly well in the books. It doesn’t translate so well to the screen and at times the interruptions to the flow are jarring enough to be classed as annoying. The movie’s take on the final battle stops short of the extremes of Miller’s original artwork but still doesn’t pull its punches. So far the critics and fans have been something of a hung jury on how good or otherwise the animated Dark Knight Returns is. Generally comments have been positive, and like Year One there’s no doubt that the story from the source material has been translated to the screen without any significant tampering. Opinions are split on the choice of Weller to play the lead. Personally I think he does a decent enough job, and at times does it better than that. There have also been grumblings about the loss of Batman’s inner monologue and the overly intrusive newscast segments. Both complaints have merit but neither issue damages the film that much overall. The underlying problem is more about expectation; Miller’s original books are arguable his best work and that makes them a tough act to follow. If you put either of The Dark Knight Returns DVDs into your DVD player in the hope of seeing 76 minutes of well crafted animation then you won’t be disappointed. You’re unlikely to be disappointed if you’re after seeing Frank Miller’s story played out by characters that you may just recognize from other Batman animated adventures. If, on the other hand, you’re hoping to see Miller’s artwork come to life then disappointment is likely to be the order of the day. Both parts 1 and 2 of Batman: The Dark Knight Returns are better than many expected them to be, but not as good as they could have been, if only because unlike the original work they are unable to become more than the sum of their parts, and perhaps it’s unfair of us to have expected them to.